Weekly therapy group for adults ages 20-30 at Courage Compass Therapy in Willow Grove, PA, with Anya Surnitsky, LCSW. There seems to be a common theme among many 20-30 year-olds: bad memories of middle and/or high school lunches. The weight of the anxiety about not having a designated table with certain people. The horror of standing out for not having said table and avoiding the lunchroom altogether. Alternatively, having to make yourself something you're NOT so that you CAN sit at a certain table. Then you ended up eating lunch in the library. With a teacher. With a guidance counselor. Ultimately with the sinking feeling that you don't belong. A feeling that eerily haunts you as you go through the next phase of your life. Sometimes we carry stories from our past into our present without realizing it. 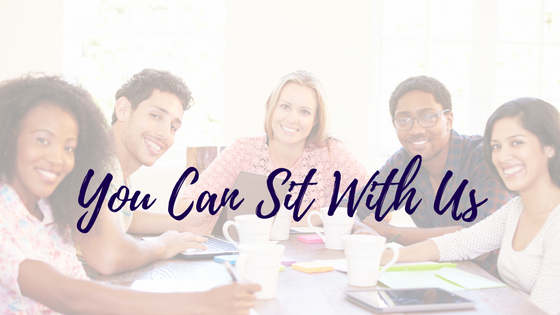 Messages of "you don't belong here," or "you're not good enough to be here" show up with new friends or in the workplace. It's a familiar feeling but you're not sure why it's showing up now. Coming to group is a way to be validated and connect with others who've shared the same experience. Of not being seen, recognized, or appreciated for who they are. Of feeling like they have to hide. Learn how to embrace what you consider your vulnerabilities in order to make them your super power. Own your quirks. Plus, connection is why we're here on earth, and it lets us know we matter and make an impact. To build genuine connection, we need trust and empathy with the judgment and shame left out. This is the place to build and practice this, so you can go and practice it in your relationships, workplace, and life outside of group. It's a place to cultivate understanding of yourself and others through validation, compassion, and support. The time and day are pending as we're waiting for you and your badassery to join us. The group will run for 1.5 hours for 8-10 weeks to start. What will group be like? The groups will be topic focused with a guided curriculum. We will cover different topics and how they affect your feelings of belonging like: fear, your inner critic, vulnerability, how you want to be seen and how you don't want to be seen, setting boundaries, among others. Part of the time will be structured with videos and questions, and part of the time will be open for sharing. The fee for the group is $70 per week. An intake is required prior to attending your first group. Please apply for a space in group below. Space is limited to 8. What 3 things are bothering you right now that group will help support? This ensures that we get comfortable with each other and are able to open up. What are your fears, if any, about group?